Installation ProcedureRemove the intake manifold cover. 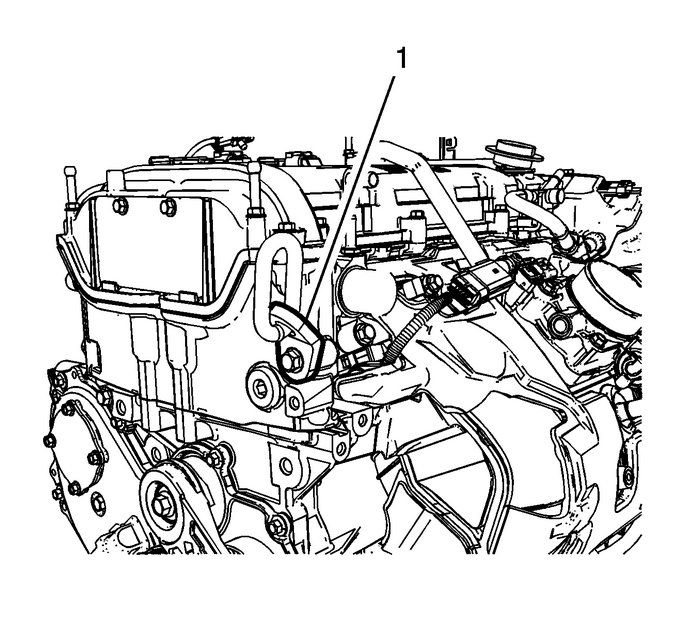 Refer toIntake Manifold Cover Replacement.Remove the right headlamp. 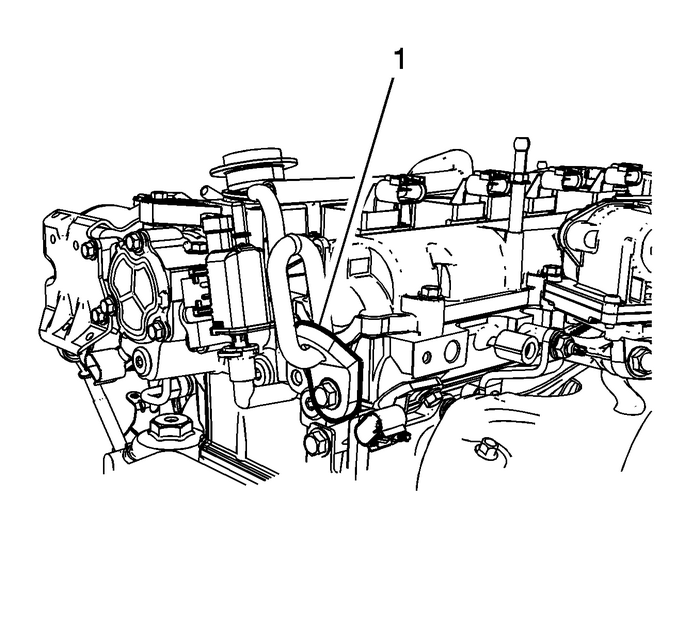 Refer toHeadlamp Replacement. 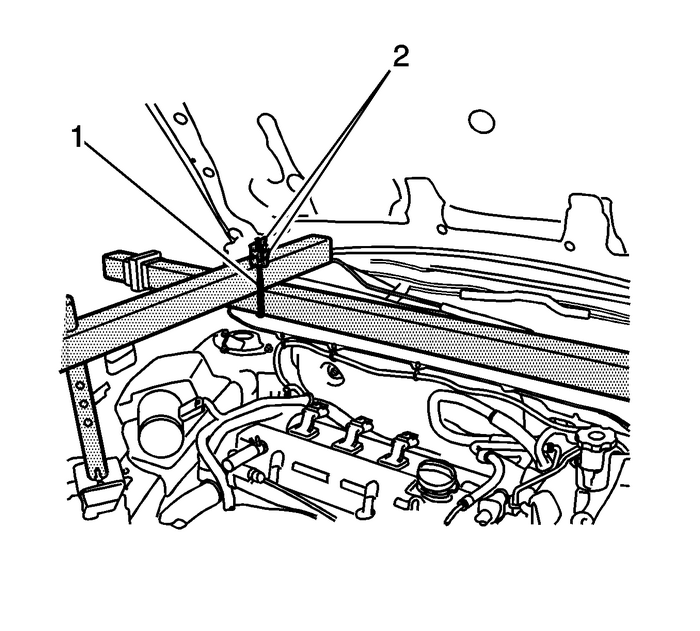 Note:Ensure the engine lift bracket is fully seated against the engine block. Install the J-36857 engine rear lift bracket (1). Install the J-36857 engine front lift bracket (1). 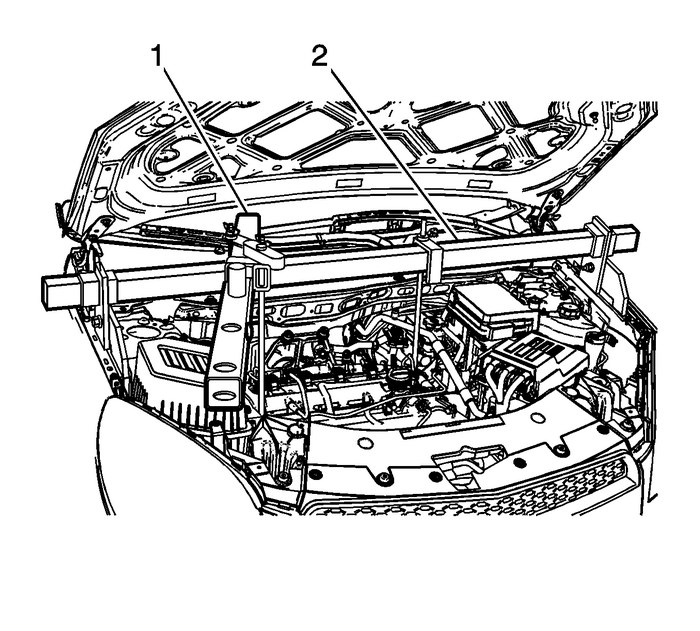 Loosen the J-28467-501 engine support fixture adapters adjusting nut.Assemble the J-28467-501 engine support fixture adapters (1) legs to the vehicle and install the J-28467-B universal engine support fixture cross bar and place across the engine compartment.Tighten the adjusting nuts on the J-28467-501 engine support fixture adapters legs until snug, then back the nut off ¼ turn. 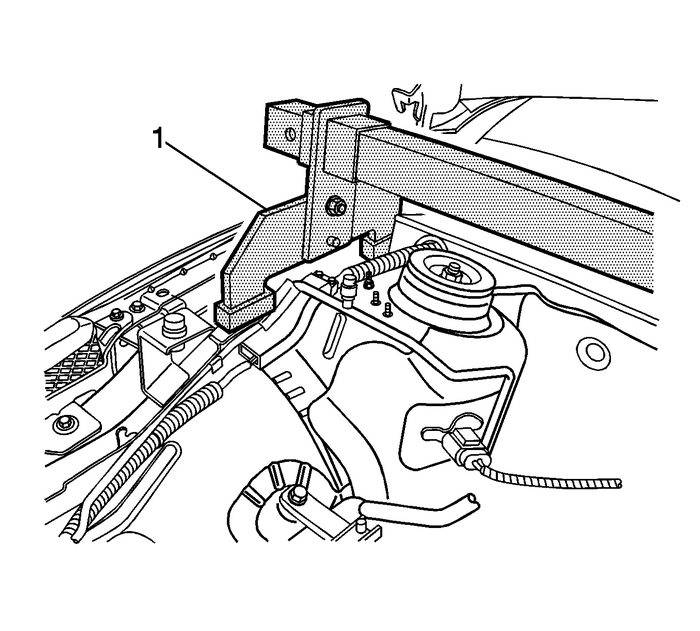 From the J-28467-B universal engine support fixture, install the radiator shelf tube J-28467-2A-(1) on top of the strut tower tube J-28467-3-(2)above the engine front (right back) lift hook bracket.Install the round tube of the front support assembly J-28467-4A-(3) through the largehole in the radiator shelf tube J-28467-2A.Locate the J-28467-4A front support assembly to the upper tie bar.Install the J-28467-9 7/16 inch x 2.0 inch quick-release pin-(4) through the top holein the J-28467-4A front support assembly. Install the J-28467-1A cross bracket assembly-(1).Hand tighten the J-28467-1A cross bracket wing nuts-(2). 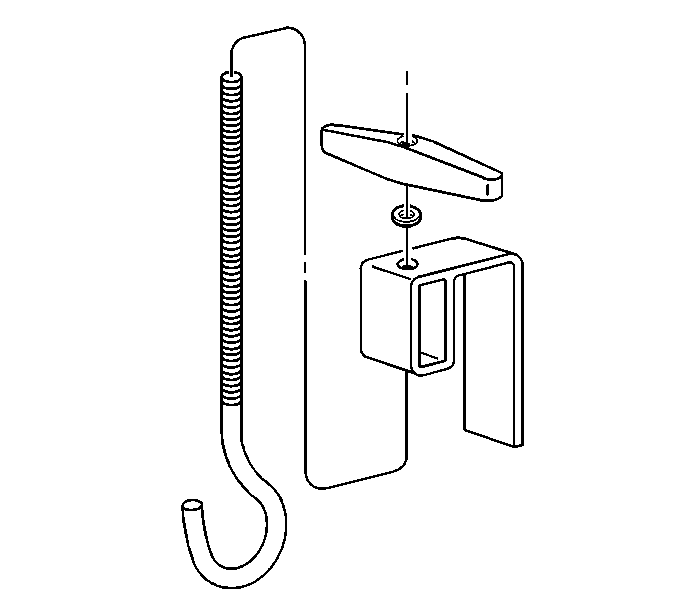 Install the J-28467-7A bolt hook through the J-28467-6A bracket.Install the J-28467-34 lift hook wing nut and washer to the J-28467-7A lift hook. 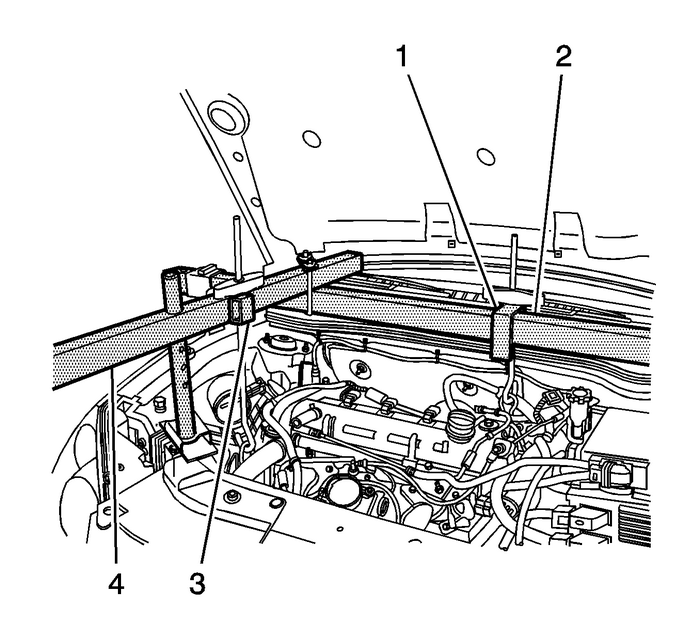 Install one of the lift hook and bracket assemblies-(1) to the engine support fixturelong bar-(2).Install the other lift hook and bracket assembly-(3) to the J-28467-2A radiator shelftube-(4) above the engine front lift bracket.Install the lift hook J-28467-7A through the engine rear lift bracket.Install the lift hook J-28467-7A (3) through the engine front lift bracket.Hand tighten the lift hook wing nuts J-28467-34- in order to remove all slack fromthe engine support fixture assembly.